Grand Forks is the third-largest city in North Dakota, home of the University of North Dakota and the seat of Grand Forks County; Grand Forks Air Force Base is located 16 miles to the west. Grand Forks’ population is approximately 60,000, while the Grand Forks, ND – East Grand Forks, MN MSA tops 102,000. Downtown Grand Forks contains a mix of office, retail, residential and government uses, including a social service/health hub. It has a National Register historic district at its core and is beginning to expand beyond its perceived boundaries. The Red River of the North, along with the Greenway that runs along both sides of it, physically separates Grand Forks and East Grand Forks, but the two downtowns function as one in many ways. 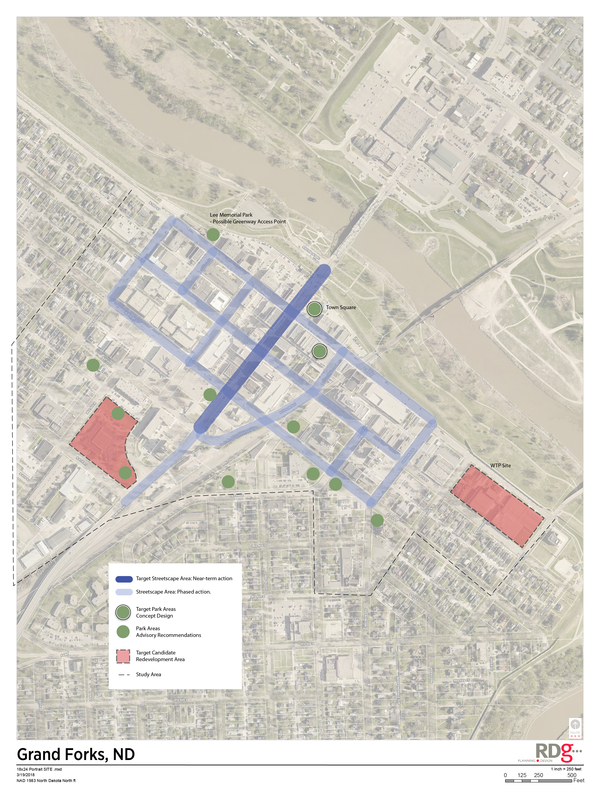 A Downtown Action Plan for Grand Forks will describe a desired vision for the future of the district and provide recommendations for public investment. A Plan helps decision makers, stakeholders, and community members define implementation projects and the community vision for the future. Doing so establishes a framework to ensure incremental policies and decisions help achieve those aspirations through the Action Plan. The map below shows the study area for the Downtown Action Plan. Phase 1 Planning: Streetscape Plan. A comprehensive downtown streetscape plan and material palette to inform reconstruction plans on Demers Avenue in the near term and other streets phased over time. This includes landscape improvements, street furniture, and lighting. Phase 2 Planning: Parks, open spaces, branding, wayfinding, and development strategies. An Action Plan for the remainder of downtown to complement the streetscape, businesses, residents, and downtown attractiveness. We look forward to your participation during this exciting time for Downtown Grand Forks! Check back often for project updates and additional ways to get involved!